My Rating: Must Read - I LOVED it! Polly Atkins, a Londoner living in New York City, is headed back across the pond for her wedding, a grand affair that has her older sister, Bella, in a whirlwind of excitement. Bella can’t wait to take over the wedding plans—and neither can Polly’s best friend, Grace, whose life as a wife, housekeeper, and mother is making her feel older than her twenty-eight years. She’s desperate to see Polly settle down in the same city—and the same life. My Review: I absolutely loved There Goes the Bride. It was a very "new" style of book to me. The story is told by two people, and one of them is NOT Polly! So there are actually three different stories inter-weaved together. The book alternates between Bella, Polly's sister, and Grace, Polly's best friend. Bella is the opposite of Polly. She is a carter, slightly overweight and average height. Polly is perfect in every way. Bella tends to date "losers" and can't have children. Polly is engaged to a "catch," Dev. Grace is more like Polly. Grace is perfect in every way, but in a miserable marriage. In There Goes the Bride, will find a great story that unwinds as you read the book, a steamy affair, a bully of a husband (I didn't like Grace's husband), an unbelievable secret, a heroine (loved Bella!) and a hot (but hairy!) Irishman! I don't want to give away the ending, but I was so shocked when I found out the secret Polly was keeping. I was so happy for Bella and Grace - way to go girls!!! There Goes the Bride would make an excellent summer read (or any time). I just loved it. Chick lit at is best, for sure. 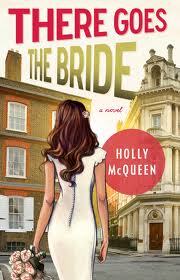 I have never read any of Holly McQueen's books, but I can't wait to get my hand on them. She has written three books (a series - The Adventures of Isabel Bookbinder): The Glamorous (Double) Life of Isabel Bookbinder, Fabulously Fashionable, and Confetti Confidential. Have you read them? What did you think? Meet the Author: Holly McQueen is the author of three previous novels: Confetti Confidential, Fabulously Fashionable, and The Glamourous (Double) Life of Isabel Bookbinder. She lives in London. You can connect with Holly on Goodreads, Twitter and/or Facebook. Purchase the Book: You can purchase There Goes the Bride at Amazon ($15.00 paperback, $10.98 Prime Members, $9.99 Kindle), Barnes & Noble (same prices) and Book Depository ($11.83).